Belgian First Division A team Gent will have to pay a penalty to Premier League side Liverpool for not naming Taiwo Awoniyi in the starting line-up in at least seventy percent of their matches during his loan spell at De Buffalo's. The former Nigeria U20 international started 35.7 percent of the matches contested by Gent before sealing a move to Royal Excel Mouscron in the January transfer window. Awoniyi made only five starts from a possible 21 in the Belgian topflight, four out of four in the Europa League qualifying rounds and started once in the Belgian Cup. ''We have given him enough chances. He started eight times with us,'' Gent manager Michel Louwagie told VISTA! ''There was also a 'penalty' in the agreement: if he did not start in 70% of the matches, we had to pay that penalty, so we have to pay for it. ''We have done everything to make him succeed. I think Taiwo works better in a system with two strikers. That was the case in the cup match against Virton and things went better''. 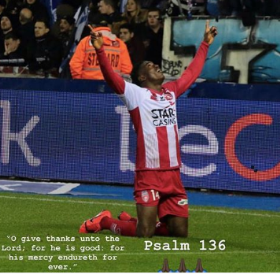 Awoniyi has been directly involved in 4 goals (3 goals, 1 assist) since his return to Royal Excel Mouscron.